In 1997, I visited San Francisco for a lesson with Tanaka Sensei. 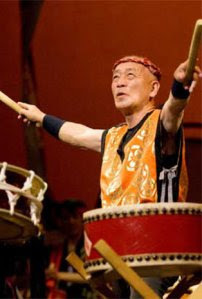 For those who don't know, Tanaka Sensei is considered the Grand Master of taiko in North America. He started SF Taiko Dojo in 1968. I had heard that Tanaka Sensei was a strict teacher. I arrived early and watched a class taught by the performing members. Sitting on the floor, I was surprised by all the egg cartons that lined the concrete walls of the dojo. I sat politely trying to watch the class and not think of eggs. During my lesson, Tanaka Sensei sized me up. Upon realizing that I was Chinese American rather than Japanese, he told me that I must explore Chinese philosophy. He revealed his fascination with Qi Gong and acknowledged the influence of Chinese aesthetics on taiko. I left the lesson empowered, not realizing how significant taiko and the incorporation of Chinese thought would become on my music. This weekend, Portland Taiko hosts joint performances with SF Taiko Dojo. Michelle Fujii, Kelsey Furuta and Toru Watanabe of Portland Taiko perform my composition News, for bamboo/paper/taiko. The work combines instruments common to both China and Japan within a structure that allows the trio to think about and explore sounds and movements that are both contemporary and classical. The performers use their bachi as writing utensils. The paper floats then flickers. Drum patterns morph from set rhythms into poetic ambiguity. Both Tanaka Sensei and Portland Taiko have taught me the importance of having a unique contribution within a community.